Collaborate with agencies to set expectations, execute on plans, and communicate from one place with our template. Working with an external agency means managing everything from pitches and plans to deliverables and budgets. Rather than follow multiple email threads to stay on top of the latest ideas and updates, why not use our agency collaboration template? It gives you a high-level view of everything your agency is working on, so you can collaborate on projects from idea to launch and communicate with internal and external stakeholders in one place. Align on priorities and timing. Ensure that your agency is clear on expectations by setting priority levels and deadlines for all deliverables. Communicate progress. Share regular status updates, so everyone understands how agency work is progressing and where things are off track. Streamline approvals. Launch campaigns more quickly and ensure nothing gets shipped without the required signoff by tracking and moving agency work through approval stages. Still working in email? We’ll show you a better way to keep conversations actionable. Build a stronger relationship with agencies with these onboarding tips. Ready to invite your agency partners? This quick tutorial shows you how to invite guests to Asana. 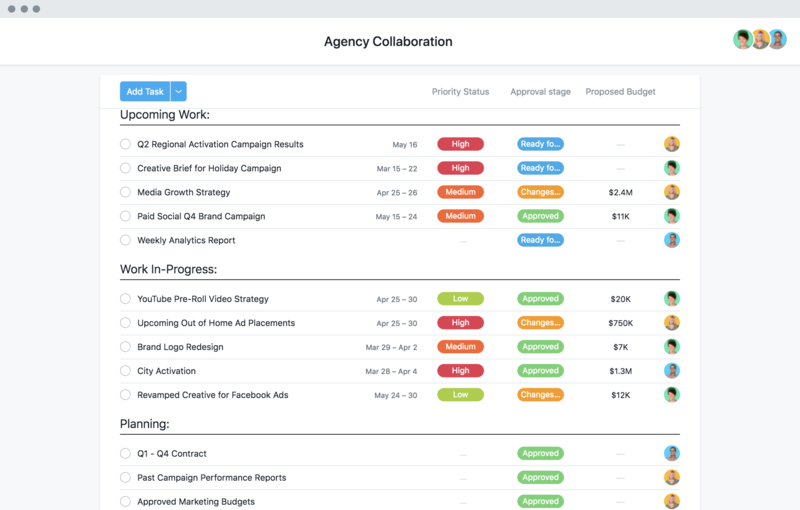 Get our agency collaboration template and more with a free trial of Asana Premium.